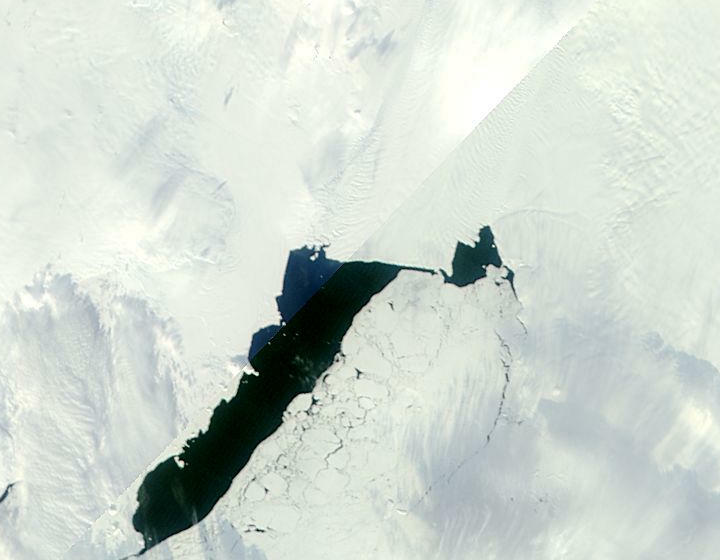 The Pine Island Glacier is a principal outlet glacier of the West Antarctic Ice Sheet draining into the Amundsen Sea. The ice stream is 40 km wide as it reaches the sea. Recent retreat, thinning and acceleration have focussed attention on this glacier. This is a brief note in support of a RealClimate article. The grounding line is of principal concern here. This is where the glacier goes afloat. The grounding line is where the bottom of the glacier comes in contact with the ground, in this case the sea bottom. 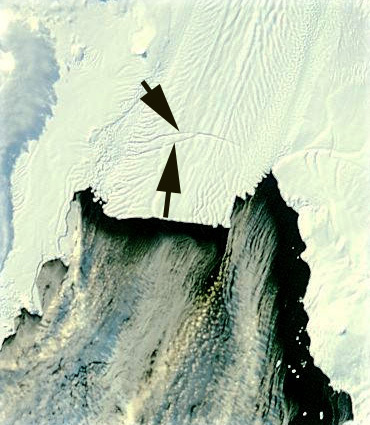 The grounding line is an anchoring point for the outlet glaciers. The length of the glacier that is grounded is being both slowed and stabilized by the basal friction. Beyond the grounding line toward the margin the floating ice shelf is susceptible to a rapid calving retreat and as the grounding line retreats, so would the calving front. Note in the image below that the current grounding line is on relatively high terrain, but is close to a deep basin. The annotated image below is from a British Antarctic Survey image, taken from their autosub program exploring beneath the ice shelf of the Pine Island Glacier combined with data from radar altimeter data flown by NASA. The second image below is a profile of depth under Pine Island Glacier from (Shepard et al, 2001)that indicates that beyond the grounding line the depth remains more than 1000 meters below sea level for approximately 200 km. Grounding line retreat could lead to the glacier retreating into this basin, not a stable situation. Basal melting is of particular concern, has been calculated to exceed 15 m/year. In addition the formation of basal crevasses which are much wider than surface crevasses may be critical in the rifting process. The British Antarctic Survey, NASA and several universities in particular have been focusing on this glacier. The second image shows the grounding line in the surface. This is an annotated satellite image from NASA. Just above the grounding line you can note that the surface of the glacier has some large scale roughness which indicates the impact of the sub-glacier topography. This topography acts to slow and buttress the glacier. This area is above the topographic rise from the deep basin to the higher terrain of the current grounding line. The ongoing focus on the Pine Island Glacier will be fascinating to watch. In particular the emphasis on the oceanographic aspects beneath the ice shelf. The melt rates beneath the ice shelf are significant, on the order of 15 m/year. This is an aspect that has received less attention and will certainly yield interesting results, considerable technologic frustrations and innovations. The nearby Smith Glacier has experienced a similar inland spread of rifting and retreat. In 2011 an additional rift has formed that is 20-25 km inland of the calving front, first noted by NASA’a Operation Icebridge. November 3, 2011 MODIS imagery is seen below. 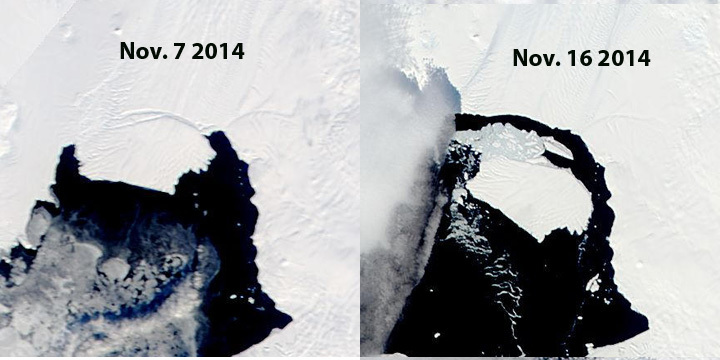 The rifts in both 2001 and 2011 have begun on the east edge of the ice stream an propogated westward. The propagation is more likely as an exploitation of basal crevasses then surface crevasses. 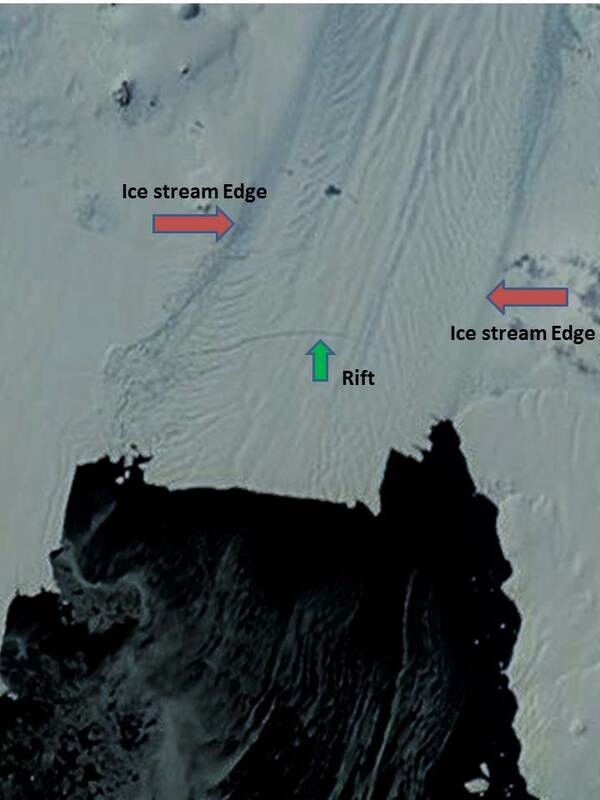 The rift from 2011 led to iceberg formation in the fall of 2013 as seen in MODIS images. On October 5, 2011 MODIS imagery indicates no rift. By Sept. 17, 2012 a second rift parallel to the first had developed. What an excellent explanation. Thank you so much. If I read your post correctly it seems the ice front will move, the basin will fill, the grounding line will extend, and the ice crumble… all within a very short time. Now with the altitude decline of the top surface, would that not further speed it up? Who is keeping the office pool on this breakup? Put me down for $2 for a breakup on March 1st that extends the ice front line past 101 degrees. Your are correct in your sequence, but not the rate. I would take your bet. This will not happen at the warp speed that thin ice shelves like Larsen and Wilkins. Note the thickness of the ice here, the ice is 5000-6000 feet thickness in this basin. And I take your word as the master of this field – and will take care not to bet against you.. So maybe I will hold the date but make it another year hence. I selected March wondering if there is enough seasonal influence on ice movement – such as the graph of Arctic ice coverage. Or is the the ice far too massive for seasonal variations? Instability might mean that small variations would have huge impacts. There was a gash in that sequence… and it looks similar to the vertical gash that is just to the left of your circle for the rifting zone.. That one in 2001 was the same glacier…moved pretty fast. This is really exciting. What is the next manifestation that you are looking for? An unmanned autonomous submarine has discovered a sea-floor ridge that may have been the last hope for stopping the now-accelerating retreat of the Pine Island Glacier, a crumbling keystone of the West Antarctic Ice Sheet, researchers announced at the fall meeting of the American Geophysical Union. The ridge appears to have once protected the glacier, but no more. The submarine found the glacier floating well off the ridge and warmer, ice-melting water passing over the ridge and farther under the ice. And no survey, underwater or airborne, has found another such glacier-preserving obstacle for the next 250 kilometers landward. Richard yes, that is the autosub based map and travel lines noted in the figure above. As the details of this come out the glacier looks even shakier.